For the 12th time, Pegasystems was cited as a Leader and is positioned furthest to the right for completeness of vision and highest for ability to execute amongst 21 vendors evaluated. Gartner assessed the Pega® Platform, which Gartner believes is the industry leading application development platform that unifies digital process automation and customer engagement—from end to end. The Pega for U.S. Navy solution is powered by an agile, unified development platform to enable organizations to modernize effectively at a fraction of the cost and time of traditional software. Our technologies drive seamless delivery across functions and silos, providing collaboration and reuse of data models without re-work or loss of fidelity - giving the Navy the tools they need for today and the future. Why choose Pega for the US Navy? • We’re ranked by Gartner1 and Forrester2 as a leading solution for iBPMS, Digital Process Automation and Mobile App Development. • Our patented, reusable architecture captures the complexity of the USN, allowing consistent governance and reuse while incorporating local process variations. 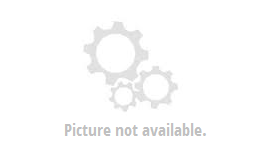 • The Pega Government Platform enables federated development so users across commands can work on parts of an application, without overwriting parallel development efforts. 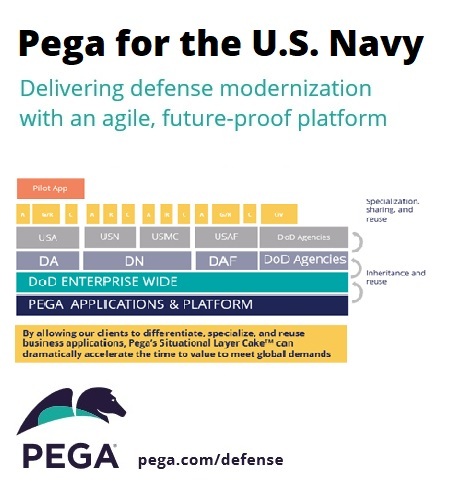 • As the USN needs grow, Pega can scale to meet the demands of a global operational force. Pega is scalable enough to support tens of thousands to millions of transactions and was chosen as the enabling platform for the 2020 Census. • Use the Pega Customer Decision Hub™ and dynamic case management to maximize operational performance. Proactively optimize the cost and duty cycle of devices and systems by sensing conditions, analyzing them, and prescribing the next best action for prevention and repair, and manage exceptions. • Bring together sensor data, event-streaming, in-memory databases and real-time analytics, enabling operators to proactively dispatch maintenance support, preventing failures and maintaining readiness standards. • Collect and integrate physical, mental and vocational test data received from potential recruits via multiple channels simultaneously, providing recruiters with a dashboard to track progress toward goals using analytics, Artificial Intelligence (AI), and contextually-driven decisioning. • Leverage Pega to build applications that automate reconciliation of transactional data from outdated systems. Track corrective actions and remediation efforts to mitigate risk and achieve unmodified audit opinions. • Automatically generate documentation as applications are designed or changed with the no-code platform, creating an audit trail of all changes. This gives users insight into how applications work, and data is used while improving management controls and reducing operational risk. • Manage a portfolio of projects and initiatives across mission areas for Research and Development with a unified platform, so organizations can rapidly design, build, test, execute, monitor and optimize work activities collaboratively without the need to write code. • Allow HQ organizations to establish and automate core processes and rules which can be inherited by subordinate organizations automatically. As changes are made, Pega’s patented, reusable architecture provides specialization and reuse of models across mission areas while maintaining compliance.